Updating a streaming pipeline that uses the Apache Beam SDK for Python is not supported. Updating a streaming pipeline that uses a Cloud Dataflow template is not supported. Updating batch pipelines is not supported. 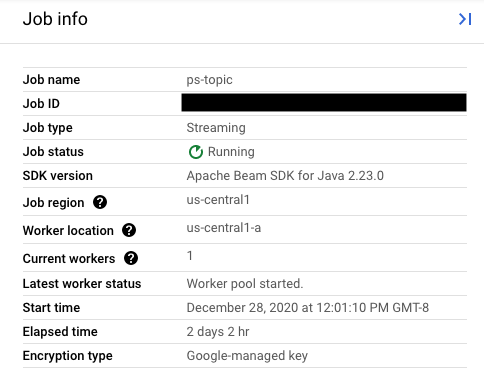 The Apache Beam SDKs provide a way to update an ongoing streaming job on the Cloud Dataflow managed service with new pipeline code. You want to enhance or otherwise improve your pipeline code. You want to fix bugs in your pipeline code. You want to update your pipeline to handle changes in data format, or to account for version or other changes in your data source. When you update your job, the Cloud Dataflow service performs a compatibility check between your currently-running job and your potential replacement job. The compatibility check ensures that things like intermediate state information and buffered data can be transferred from your prior job to your replacement job. Note: It is possible to use the Update feature to scale a streaming Apache Beam pipeline to use a different number of workers. See Manual Scaling in Streaming Mode for instructions and restrictions on doing so. When you update a job on the Cloud Dataflow service, you replace the existing job with a new job that runs your updated pipeline code. The Cloud Dataflow service retains the job name, but runs the replacement job with an updated jobId. The replacement job preserves any intermediate state data from the prior job, as well as any buffered data records or metadata currently "in-flight" from the prior job. For example, some records in your pipeline might be buffered while waiting for a window to resolve. Even though you've added a transform to filter out strings that begin with the letter "A", the next transform (FormatStrings) may still see buffered or in-flight strings that begin with "A" that were transferred over from the prior job. You can change windowing and trigger strategies for the PCollections in your replacement pipeline, but use caution. Changing the windowing or trigger strategies will not affect data that is already buffered or otherwise in-flight. We recommend that you attempt only smaller changes to your pipeline's windowing, such as changing the duration of fixed- or sliding-time windows. Making major changes to windowing or triggers, like changing the windowing algorithm, might have unpredictable results on your pipeline output. Set the --jobName option in PipelineOptions to the same name as the job you want to update. If any transform names in your pipeline have changed, you must supply a transform mapping and pass it using the --transformNameMapping option. Caution: To facilitate the mapping between transforms in your prior pipeline and your replacement pipeline, give explicit names to every transform in your pipelines. By default, Cloud Dataflow generates a warning if you do not explicitly name your transforms. You can increase this warning to an error. Figure 1: The Summary tab for a running Cloud Dataflow job, with the Job Name field highlighted. 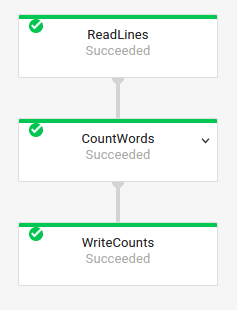 You only need to provide mapping entries in --transformNameMapping for transform names that have changed between your prior pipeline and your replacement pipeline. Figure 2: The execution graph for a WordCount pipeline as shown in the Cloud Dataflow Monitoring Interface. Transform names are hierarchical, based on the transform hierarchy in your pipeline. If your pipeline has a composite transform, the nested transforms are named in terms of their containing transform. For example, suppose your pipeline contains a composite transform named CountWidgets, which contains an inner transform named Parse. The inner transform's full name will be CountWidgets/Parse, and you must specify that full name in your transform mapping. If your new pipeline maps a composite transform to a different name, all of the nested transforms are also automatically renamed. You'll need to specify the changed names for the inner transforms in your transform mapping. If your replacement pipeline uses a different transform hierarchy than your prior pipeline (e.g. because you refactored your composite transforms, or your pipeline depends on a composite transform from a library that changed), you'll need to explicitly declare the mapping. When you launch your replacement job, the Cloud Dataflow service performs a compatibility check between your replacement job and your prior job. If the compatibility check passes, your prior job will be stopped. Your replacement job will then launch on the Cloud Dataflow service while retaining the same job name. If the compatibility check fails, your prior job will continue running on the Cloud Dataflow service and your replacement job will return an error. Use pipeline.run().waitUntilFinish() in your pipeline code. Run your replacement pipeline program with the --update option. Wait for the replacement job to successfully pass the compatibility check. Exit the blocking runner process by typing Ctrl+C. Alternately, you can monitor your replacement job's state in the Cloud Dataflow Monitoring Interface. If your job has started successfully, it also passed the compatibility check. The compatibility check ensures that the Cloud Dataflow service can transfer intermediate state data from the steps in your prior job to your replacement job, as specified by the transform mapping that you provide. The compatibility check also ensures that your pipeline's PCollections are using the same Coders. Changing a Coder can cause the compatibility check to fail because any in-flight data or buffered records may not be correctly serialized in the replacement pipeline. Changing the pipeline graph without providing a mapping. When you update a job, the Cloud Dataflow service attempts to match the transforms in your prior job to the transforms in the replacement job in order to transfer intermediate state data for each step. If you've renamed or removed any steps, you'll need to provide a transform mapping so that Cloud Dataflow can match state data accordingly. Changing the side inputs for a step. Adding side inputs to or removing them from a transform in your replacement pipeline will cause the compatibility check to fail. Changing the Coder for a step. When you update a job, the Cloud Dataflow service preserves any data records currently buffered (for example, while windowing is resolving) and handles them in the replacement job. If the replacement job uses different or incompatible data encoding, the Cloud Dataflow service will not be able to serialize or deserialize these records. Caution: The Cloud Dataflow service currently cannot guarantee that changing a coder in your prior pipeline to an incompatible coder will cause the compatibility check to fail. It is recommended that you do not attempt to make backwards-incompatible changes to Coders when updating your pipeline. If your pipeline update succeeds but you encounter issues or errors in the resulting data, ensure that your replacement pipeline uses data encoding that is at least compatible with your prior job. Transforms that produce or consume side inputs. Transforms that use keyed state. Transforms that have window merging. You're attempting to run your replacement job in a different geographic zone. You must run your replacement job in the same zone in which you ran your prior job. Last updated February 26, 2019.